The grit and determination of high-class galloper Melody Belle was plain for all to see at Hastings today as she triumphed in the season’s opening Group One feature, the Tarzino Trophy (1400m). Beautifully handled by Malaysian-born rider Shafiq Rusof, the Commands mare justified her favourite’s tag for the contest when she held out the challenge of the well fancied Hiflyer in a desperate finish to the event. The victory added a second win at the highest level in New Zealand for her owners, the Fortuna Melody Belle Syndicate (manager John Galvin), after she triumphed in the Gr.1 Manawatu Sires Produce Stakes (1400m) as a two-year-old. The win was also the first Group One trophy for trainer Jamie Richards in his own right after he took over the reins at the powerful Te Akau Racing operation at the start of the new season. “I’d just like to give a big thank you to all the staff at home,” Richards said. Richards was fulsome in his praise for Melody Belle who was having her second start in this campaign after winning the Gr.2 Foxbridge Plate (1200m) at Te Rapa last month to kick off her four-year-old season. “It was a terrific win and a terrific ride,” he said. 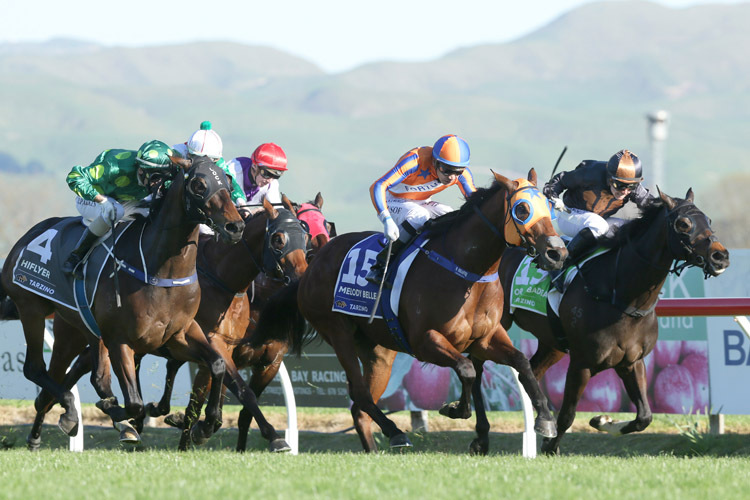 “We were really pleased how she came through the Te Rapa run. Richards was keen to see how the mare comes through her effort before deciding on her next challenge but wasn’t ruling out a tilt at the Gr.1 Windsor Park Plate (1600m) on the second day of the carnival. “We’ll sit down now and have a talk with John,” he said. “She stuck at it pretty good today although she has never had a go over a mile. Rusof has made a favourable impression since returning to New Zealand in March this year following a successful stint in Singapore. He has come full circle to the country where he honed his craft as an apprentice jockey under Mark Walker’s tutelage at Te Akau Racing before following Walker to Singapore when he relocated in 2010. “She is a superstar and a high-class horse who just gives everything to the line,” he said when questioned after the race. Bred by Marie Leicester, Melody Belle was a $57,500 purchase for Te Akau boss David Ellis from the Haunui Farm draft during the Premier session of the 2016 National Yearling Sale at Karaka. The victory takes her career earnings to over 0 from seven victories, with six of these at stakes level including the rich Listed Karaka Million (1200m) as a two-year-old.